Many common issues that garage doors develop can be traced back to a lack of regular maintenance. 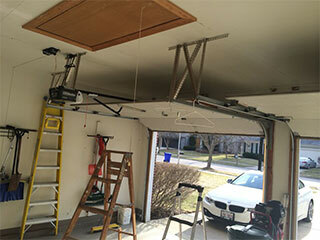 When a piece of machinery is used as often as your garage door gets used, it understandably begins to suffer from wear and tear - the strain of opening and closing several times a day can take its toll on the system's moving parts, and there are many components that can benefit from regular maintenance. As a door is used day in and day out it will often begin to show signs of wear and tear; if these parts are not professionally serviced on a regular basis it can lead to further, more serious problems arising. Unexpected repairs can often be more expensive and difficult to deal with, so we highly recommend arranging for regular garage door maintenance as a way to catch any potential problems before they occur. During a checkup appointment our technicians will examine the many different components of your door for signs of wear. Mechanical systems such as rollers, pulleys and cables might require lubrication, safety sensors might require cleaning or realignment, and the door’s electrical systems may also be in need of care. By arranging for professional maintenance services to be carried out on a regular basis, homeowners can greatly reduce the possibility of their garage door developing a major problem. Our technicians are highly experienced in a providing this service, and can quickly and accurately diagnose any underlying issue with your door. Many garage door manufacturers require annual servicing as part of their warranty - it’s absolutely vital to ensure that your door receives the attention it needs to continue working at maximum efficiency for a long time. Contact our experts at Garage Door Repair Richmond today to find out more about our garage door maintenance services, and how we can help you.